With swift, high and near freezing water (we started less than 2 weeks after ice out on Teslin Lake), this trip was a bit more than Claudia and I bargained for. Our trip started with hitchhiking from Whitehorse to Johnsons Crossing for the put in and from there, 100 miles of paddling on the Teslin River to the Yukon River, then 100 more miles of paddling on the Yukon to Carmacks. 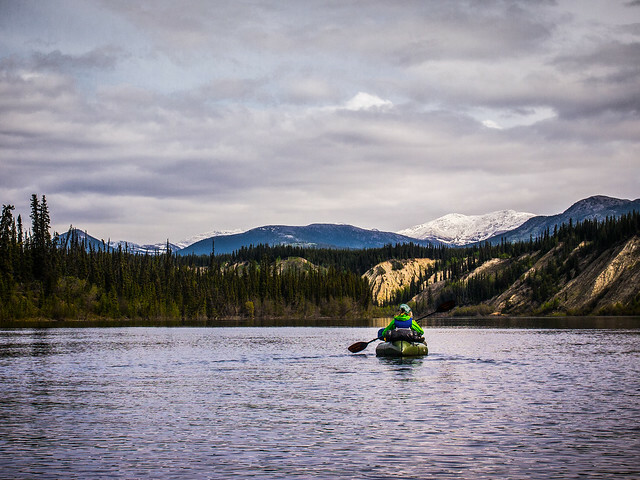 The banks of the river still had ice in places the high water didn’t sweep it away and the current was so fast it took a just over two days to cover the 100 miles to the junction with the Yukon River – paddling 8 hour days – in packrafts! In addition, lots of big eddies and boils added some adventure to an otherwise calm river trip. 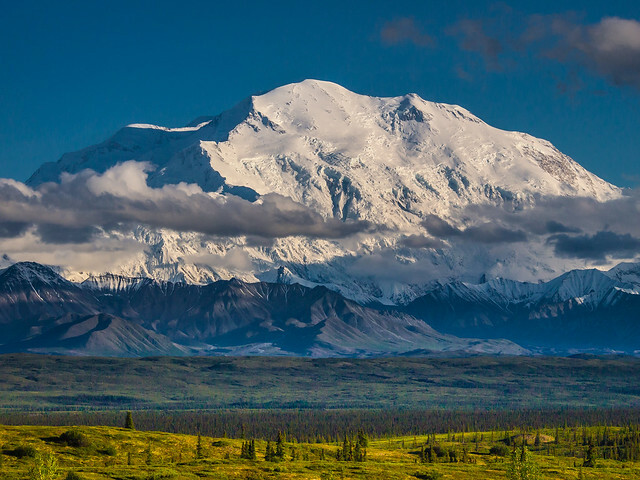 Denali National Park, in my opinion, is one of the best managed park in the US. Private vehicles, with just a few exceptions, are only allowed to drive the first 14 miles to the Savage River Bridge, of the 90 mile long Park Road. For me, I rode about 2/3 of the way to Wonder Lake Campground, backcountry camped (the backcountry permits are free), then rode to Wonder Lake where I spent two days enjoying the rain and an amazing view of Denali. I’m not much of a pay to camp person, but Wonder Lake Campground is worth every penny and then some. From Wonder Lake, I spent two more days riding back out of the park. 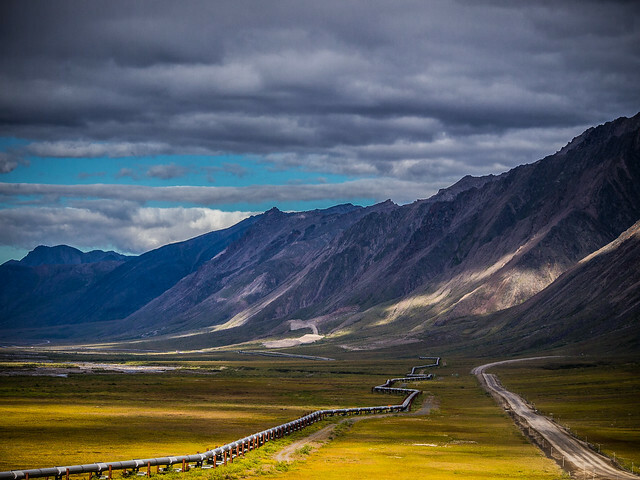 3: Biking and Driving the Dalton Highway from Deadhorse. Much of what I’ve read about the Dalton Highway, aka The Haul Road, has to do with it being the road to the furthest north point on the Pan American travel route, but what I also found out was this road goes through some of the most beautiful land I’ve ever seen. For me, the stretch that travels over the Brooks Range and through the tundra, from the Arctic Circle to Deadhorse, is hard to beat. Traffic, for the most part, is curious towards cyclists, but the always possible flying rocks when vehicles pass, some of them fist sized, keep you on your toes. Traveling to The Bus has been a dream ever since I read Into The Wild almost 20 years ago and this trip didn’t disappoint. Located about 20 miles up the Stampede Trail, with lots of beaver swamps and two river crossings, it’s not easy to get to. 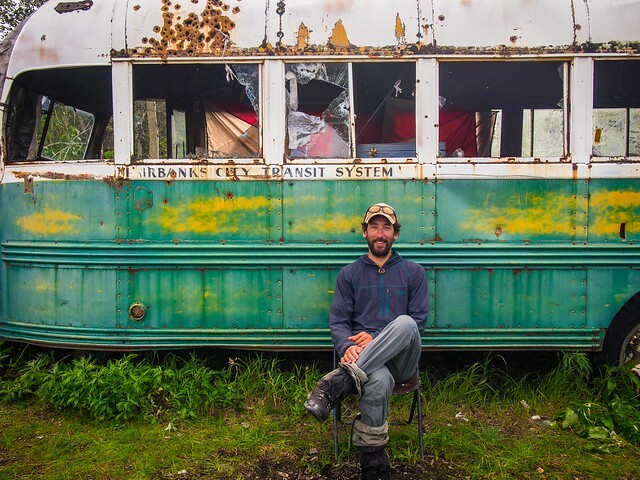 It’s also located in the Alaska wilderness, far from help, a fact that many people who travel to The Bus seem to ignore. Claudia and I brought packrafts for the Teklanika River crossing, which made the crux of the trip quite easy. Next stop, Baja Mexico for some whale watching and much needed warmth. Good to hear your are still living the adventurous life. I’m heading to Yukon next year for 6 weeks – the rough plan is to hang out in the Whitehorse area for a couple of weeks and ride, then ride the Dempster Highway. Might have to get myself over to Alaska, after seeing your fantastic photos. Thanks Malcolm. The trails around Whitehorse are awesome and the Dempster, especially around Tombstone Territorial Park, is beautiful. Also, have you checked out the Canol Road? I was on it this fall and while there isn’t a flat spot on the road, there’s also no traffic and the scenery is beautiful.